The Last Five Turns Event is an event from the Mario Party series that takes place when there are only five turns left in the (board) game (four in Mario Party 7 due to Bowser Time). 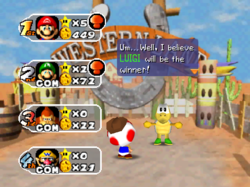 The event debut in the original Mario Party, which Koopa Troopa talks to the players playing the game to announce the current standings, then predicts who the Superstar is at the end of the game. The prediction is chosen randomly; it is not influenced by the players' current stats and has no effect on the outcome of the game. Then, for rest of the game, both Blue Spaces and Red Spaces are worth twice the normal number of coins when landed on (players will get or lose 6 coins), and Koopa gives twenty coins to players who pass him. In Mario Party 2, the event is hosted by Toad (and Baby Bowser in Bowser Land), who first gives the current standings then introduce a character to predict the Superstar. Usually, a green or red-shelled Koopa Troopa predicts it, but sometimes Whomp makes the prediction (who will always choose Mario, even if he isn't competing). However, it is always Bowser who makes the prediction (who will always choose the player who currently is in last place) in Bowser Land. The predicted player is given ten coins from the predictor. From that point onward, Blue and Red Spaces' value are doubled again, and players that land on the same space as another player play a Duel Minigame with that player before activating the space. 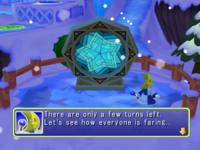 In Mario Party 3, the event is the same as the last game, but it is usually the Millennium Star (and rarely Whomp) who predicts who the Superstar is, giving them ten coins. Sometimes, Baby Bowser hosts the event and lets Bowser predict who the loser is. 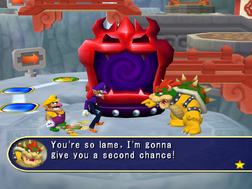 The predicted player ends up losing ten coins to Bowser. Afterwards, Blue and Red Spaces' value are doubled once more, and players that land on the same space as another player play a Duel Minigame with that player before activating the space, as in the last installment. Mario Party 4's version of the Last Five Turns Event. Here, Boo is announcing the lottery drawing. Coin Multiplier: Blue and Red spaces are worth double coins (an event from the previous three installments in the Mario Party series). All Red Spaces become Bowser Spaces. All Red Spaces become Fortune Spaces. Star Present: The price of Stars changes from 20 coins to being absolutely free (this event sometimes does not appear in the roulette). Plus Spaces and Minus Spaces are worth triple coins (and players either get or lose 9 coins), a strengthened version of the old rule from the previous four installments. All Minus Spaces become Bowser Spaces (returning from the previous installment). All Plus Spaces and Minus Spaces become Capsule Spaces; existing Capsule Spaces are overridden. Five Star Spaces are on the board at all times. Also, like in previous games, when a player lands on the same space as another player during the last five turns, a duel minigame is initiated. In Story Mode, Bowser hosts the event. He first gives the current standings. Then, he says that the coins earned in duel battles (from Duel Spaces) are doubled. If the player lands on Koopa Kid, they will lose 10 coins if they lose the minigame; however, if Koopa Kid loses, he will lose 30 coins. If Koopa Kid lands on the player, they will lose 20 coins if they lose the minigame, but if Koopa Kid loses, he will lose 10 coins. Blue and Red Spaces are triple the number of coins (so characters gain or lose 9 coins), as well as gaining 15 coins when landing on their own Character Spaces. Have five of their Character Spaces added to the board. Bowser Revolution: Bowser comes to take everyone's Coins and splits them evenly among all the players. There are only cosmetic differences between Brighton's and Twila's hosting of this event. As with the last game, if both players land on the same space, then it will trigger a Duel Minigame. Landing on Blue and Red Spaces gives and takes triple the number of coins respectively (as well as landing on one's own Character Spaces). The player (or team) receives 40 coins. The price of Stars is halved (for Grand Canal and Bowser's Enchanted Inferno! only). The price of riding Chain Chomps is halved (for Pyramid Park only). All Red Spaces become Bowser Spaces (cannot occur on Grand Canal and Bowser's Enchanted Inferno! ; there are no Bowser Spaces on Bowser's Enchanted Inferno despite the fact that it is a Bowser board). Ten Koopa Kid Spaces are added on the board. Since Mario Party 4, if more than one player/team is in last place, the player/team in the bottom of the standings will be the one to spin a roulette. Additionally, a Duel Minigame will no longer occur if a player lands on the same space as another player. 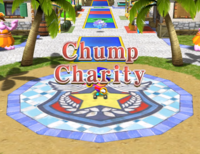 In Mario Party 8, this event is retooled and renamed Chump Charity, and is hosted by MC Ballyhoo. First, Ballyhoo gives out the current standings, as is commonplace with previous games. He then gives the player(s) or team in last place a piece of Duelo Candy. If the game is being played on Koopa's Tycoon Town, Ballyhoo gives the player(s) or team 30 coins instead. Then, his hat, Big Top, showers the entire board with coins, placing a Coin Bag on each Red Space and one coin on all other spaces unoccupied by players at the time. In Star Battle Arena, there is a very similar version of this event called Special Bonus. Here, MC gives out the standings, and the losing player uses the dart wheel to obtain a prize to try to catch up to the goal before their opponent does. In Mario Party DS, the Last Five Turns Event is renamed Final 5 Frenzy. In it, Bowser gives out the current standings as usual and gives the losing player a bonus, chosen by a wheel. All Friend Spaces are also changed into Duel Spaces. It will never be possible for the yellow prizes to be landed on. When stopping the wheel, players see that the wheel can stop on the yellow prizes for two seconds, before Bowser rigs it to land on a different prize. Furthermore, the game's star counter caps at 99, preventing any further stars from being added. If the last place player does land on "Get 100 Stars" or "Get 300 Stars" (the yellow prizes) then Bowser will run away and the player does not get anything for the prize. However, it will sometimes be possible for a player to become the leading player due to the Final 5 Frenzy alone. For instance, all players have the same number of stars at the beginning of the 5th-to-last turn and the wheel lands on Get 1 Star. If more than one player is in last place, Bowser will this time randomly choose one player from last to spin the roulette, instead of the player who is in the bottom of the standings. In Mario Party 9, due to the new gameplay, games are no longer played based on the number of turns, but rather how long it takes to reach the end of the board. However, a similar event still occurs. The event is called Almost There!, and it occurs when the players are almost at the end of the board, when they pass by Green Toad. His green-spotted flag pops up beside him as he gives out the current standings. Last place players get a Slow Dice Block. Anybody tied for last will receive a Slow Dice Block as well, including if everyone is tied for first. Additionally, minigames are now selected by the player currently in last place, not the captain (unless the Captain is in last). This does not matter who is hosting a minigame; the boss minigame is still selected by the captain, regardless of their position (except at Bowser Station and DK's Jungle Ruins, where players are not given the option of choosing which boss minigame to play). If two players tie for last place, one of them is randomly chosen to pick a minigame, regardless if the player is a human or CPU. The Captain can still choose a minigame after the Almost There event if any of these situations occur. During the event, Bowser also appears and asks the captain if they want "a whole bunch" of presents; if the captain agrees, he turns three to six predetermined spaces into Bowser Spaces; the spaces that he chooses never change. If the captain refuses Bowser's offer, he gives the players "a few" presents by turning 2 or 3 predetermined spaces into Bowser Spaces. On some occasions, Bowser will chastise the captain for being "a stick in the mud", and act as though they accepted his offer. If the Captain in this event is a CPU, then they will always accept Bowser's offer to turn three to six predetermined spaces into Bowser Spaces. In Bowser Station, the choice is not given at all; Bowser automatically adds five Bowser Spaces to preset locations on the board. Four of the spaces are placed within the last six spaces of the route, along with a Jackpot Space and a Back Space; the latter's presence increases the odds of players being stuck in the gauntlet of Bowser Spaces for as long as possible. In Mario Party 10, the event is called Homestretch! (Home Straight in PAL versions). The events vary depending on which party mode is being played. 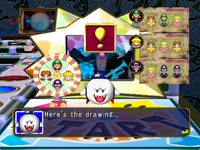 In Mario Party mode, if played on any of the boards except Chaos Castle, the standings are shown, and then Blue Toad gives the player in last place a Slow Dice Block, just like in Mario Party 9. If numerous players are tied for last place, however, they do not get a Slow Dice. If played on Chaos Castle, instead of last place receiving a Slow Dice Block, it acts like a Toad House, giving everyone a Special Dice Block before the gate opens. Then, if Bowser (or Yellow Toad in Chaos Castle) wasn't freed, the gate closes, leaving him sealed inside, then, Bowser Jr. appears and makes Bowser Jr. Spaces appear by throwing bombs on specific spaces. If playing on Chaos Castle or if Bowser had been freed before Homestretch, this does not happen. Finally, Blue Toad reminds the players that to be careful on those last spaces. In Bowser Party, Blue Toad reminds Team Mario to be careful on those last spaces. Then, Bowser Jr. reminds Bowser that Team Mario is close to the goal, then Bowser spins a roulette that can make him go into Big Bad Bowser Mode, add Bowser Jr. Spaces to the board or give him an extra Bowser Dice Block. In amiibo Party, since the rules are similar to that of past Mario Party installments, Homestretch is similar to that of the Last Five Turns Event. However, it occurs on the after the minigame set before the eighth turn. When it happens, the standings are shown, then the person in last place gets a coin bonus. Afterwards, players can also pay 40 coins to get two Stars (or possibly 20, 30, or 50 if played on the Toad Board or at least if the top left corner is the Toad Board), and when landing on a Blue Space or a Red Space, players earn or pay 6 coins. In Mario Party: Star Rush, this event, called The Last Hurrah, appears in Toad Scramble and Balloon Bash. In Toad Scramble, it occurs when the final boss appears, while in Balloon Bash, it occurs in the last three turns, like in the amiibo party of Mario Party 10. The player in last place is given an item. For Super Mario Party, the event takes place during the last three turns. First, the current standings are shown and Toad gives an assessment. A guest character, either the board's unique event character or Lakitu, will enter and pick a character whom they think will win, usually the one ranked lowest. That character will then receive an item. Plus and Minus Spaces will have their coin output increased to six in most boards, and ten in Kamek's Tantalizing Tower. Lastly, Kamek will turn the Bad Luck Spaces into Extra Bad Luck Spaces that have harsher penalties. In Partner Party mode, the events are slightly different. The standings, assessment, predication and item reward are the same as Mario Party mode. After the item has been distributed, the number of Stars that can be purchased at a time will increase from one to two, or two to three on Tantalizing Tower Toys. After Kamek changes the Bad Luck Spaces, an additional five allies will be distributed across the board for players to pick up. French (NOA) Dernière ligne droite! (Mario Party 9-10) Home stretch! The only Mario Party games so far that do not include a Last Five Turns Event are Mario Party Advance and Mario Party: Island Tour, although the latter has a similar unnamed event that occurs on the boards. In the Mario Party 7 manual, it says 10 Blue or Red Spaces turns into Bowser Spaces in the Last Four Turns. This is most likely an error, as Blue and Red Spaces turn into Koopa Kid Spaces in-game. This page was last edited on March 3, 2019, at 19:53.